Dosage: Mix 2 tablespoons (16 g) in a cup or more of hot / cold water daily. 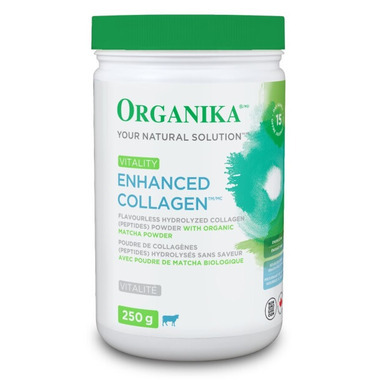 Ingredients: Per tablespoon (8g): Hydrolyzed Collagen (Bovine Skin) 5 g, Organic Matcha Powder (Camellia sinensis)(Leaf) 3 g (Standardized to contain 2.5% Caffeine). I LOVE this product! Great afternoon pick me up and i know that it is completely pure and healthy for my body..i make it like a tea latte, stir it with a bit of store bought coconut milk (that i normally use in my coffee)first, then add a bit of hot water to top it up..perfect temperature so i can drink it up right away. Great as a snack to fill my tummy in place of something less healthy for me(chips! )ðŸ˜� and great on the go, too, of course in my Libre tea mug! I'm going to start a cleanse as soon as I'm finished breast feeding and i will gladly replace my coffee in the morning with this! I am really enjoying this matcha collagen product! I mix it in soy milk and it tastes lovely. It's exactly what I wanted. Just wish the container was bigger, he he!